So we're doing 'summer school' in March, but we're calling it JumpStart, and that's all I'll say about that, but today had a pretty special moment. 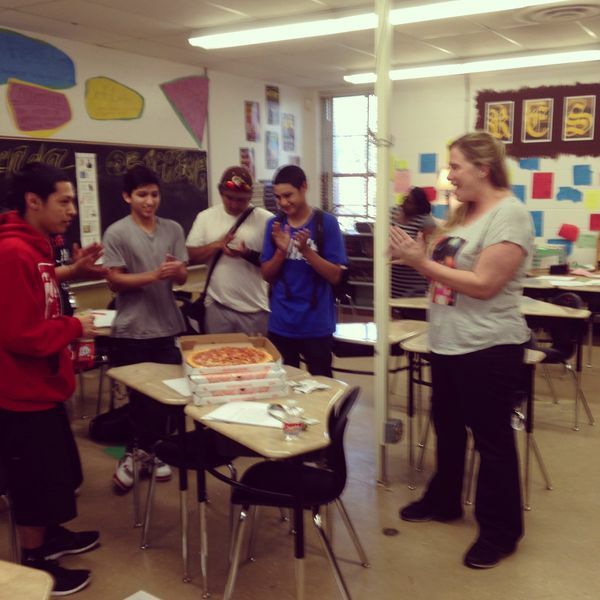 A few students from Mrs. Garcia's English II JumpStart class decided to surprise her with a pizza party today, since it was her birthday and I had turned down their first offer of no school as their preferred method of celebration. These guys are absolute troopers; no complaints about staying at school until 6:30pm (Tuesday-Thursday), and they are working hard each day. So "Happy Birthday!" to you, Mrs. Garcia, and thank you for the work you're doing with the kids. You obviously know how to create strong positive relationships with kids if they're willing to spend their own money buying the whole class pizza for your birthday!